Easy to hear, easy to use, hard to break and impossible to mess up. Versatile, feature-rich, modern, compact and durable. Press Talk button once for the time, and again for the date. Features an easy-to-hear, crisp male voice. 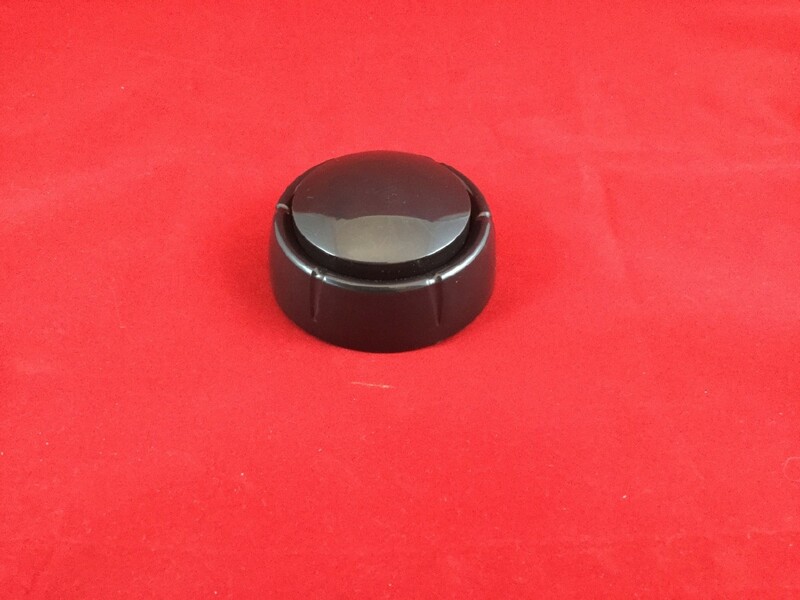 Resembles a small wheel, turned on its side and gently sloping upwards, with 4 rubber feet. To set, press recessed Set button on the bottom with the head of a pen. Measures about 3-1/2 in by 1-1/2 in. The most versatile, feature-rich timepiece you'll ever find! This high-value, low-profile clock combines superior American engineering with a refreshing dose of simplicity. The result is a compact, durable clock that can be placed anywhere, ready to give you the current time and date at the touch of a button. If we had to pick just one clock that was our favorite, this would be it. The entire top of the clock consists of the super-sized Talk button, which measures a full inch-and-a-half in diameter. Simply press this button, and the time is spoken in a crisp, male voice - "The time is 4:40 PM." The voice is loud enough to be heard by the elderly, yet not so loud that it disturbs those around you. If you want to hear the date, just press the Talk button again. "The date is Saturday, 15 June." Setting the clock is accomplished with equal ease, by pressing the recessed Set button on the underside of the timepiece with the head of a pen. Because the Set button is indented, it is impossible for someone to bump anything and accidentally change the time. Whether you're taking this clock with you on a trip, or giving it to an elderly person, it will always be ready to provide the correct time and date, every time. Even the battery compartment is safe, held closed by a small screw. Our Talking Calendar Clock resembles a small wheel, turned on its side and gently sloping upwards in a sleek, modern design. It sits firmly on any surface, held in place by four rubber feet. But even if it does happen to fall off the desk a few times, you shouldn't worry. It is built to last, and its durable housing is designed to stand up to a good deal of abuse. In short, it's easy to hear, easy to use, hard to break and impossible to mess up. It's our favorite talking clock of all time, and we know it will be yours, too. Takes 2 AAA batteries, which are not included. Directions for the Talking Calendar Clock From Future Aids, The Braille Superstore. Your new calendar clock will arrive without batteries. The first thing you need to do is unscrew the battery compartment door, and place 2 AAA batteries inside. You will find the battery compartment on the underside of the clock, and the screw is right near the rim of the clock between two of the rubber feet. You will need a small Phillips or star-head screw driver to accomplish this. The set button is located between the two rubber feet counter-clockwise (or 45 degrees) from the battery compartment. You can press the indented Set button with the head of your small screw driver, the tip of a pen, a Braille stylus ... anything that's reasonably thin. Each time you press the Set button, a new choice is selected. Use the large Talk button on the top of the clock to cycle through the choices. For instance, to set the current Hour to 9 AM, press the Set button, and Set Hour is heard. Press the Talk button until 9 AM is heard. Repeat this procedure to set Minute, Year, Month, Date, Alarm Hour, Alarm Minute, and Alarm On-Off. A final press of the Set button (or a 5-second timeout) returns the clock to normal Mode, at which point a single beep is heard. Now that your new clock is all set up, flip it right-side-up and set it on its sturdy rubber feet. Press it once to hear the time, or twice to hear the date. That's it!